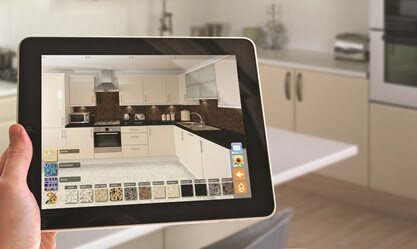 In the last several years, our company has witnessed a great deal of change in how smart devices can improve our clients’ enjoyment of the design-build experience. At Classic, we have used two devices in particular to help us transform the way we communicate with our customers: the iPhone and the iPad. It’s now hard to think about how we got along without such a marvelous device. It has combined what were once separate communication devices - a phone/texting device and an email platform (formerly laptops) - allowing us to respond more quickly to questions or concerns our customers might have about their project. This centralization of communication creates much less confusion. Apple has also bundled a camera into the device, which provides us with the ability to send pictures from the field to customers if a question arises. No longer is it necessary to schedule a meeting to review minor details, since this may all be completed now through the device. Finally, with the iPhone we have complete and live access to our contact database. If we have a salesperson in the field who needs an alternate phone number for a client, they have the information with them. It also simplifies mapping and directions for our salespeople and project manager, which is a crucial feature when projects span the greater metropolitan area. The iPhone also allows access to the ever-expanding world of industry apps. A variety of apps have already been created to aid with everything from estimating, calculating material quantities, and matching paint colors. New apps are constantly being developed and will only continue to offer new ways for us to improve how we do business. Like the iPhone, the iPad has allowed us to centralize our written communication systems – but with a much better format because of a larger screen. It is now very simple to respond to even a lengthy email in a short amount of time. One of the nicest features of the iPad is the ability to present plan drawings and 3D renderings in full color, either in a customer’s home or here in our showroom using Apple TV with a large monitor. The ability to present in this fashion greatly enhances the customer’s ability to review their project in a much more interactive way that makes more sense than on paper. The iPad also allows us to have complete and live access to all of our current project data using Dropbox – an innovative web based tool which links the devices to the data on our company server. So if a question arises onsite, we have access to the right information. No need to lug around a binder full of paper! But, one of the most useful features of the iPad is the ability to simplify the product selection process. This has always been one of the most challenging areas of our business – for our customers and for us – because of the sheer number of products available. In years past we would visit product showrooms, which was time consuming and overwhelming for the client. The iPad has provided a way for us to create product catalogues and then make thoughtful recommendations based on our customer’s taste and our experience. We then can email them a summary of their selections and have one complete list – including photos. We are even working on developing a web based app which we can further customize, making the process even simpler. Apple’s iPhone and iPad have had a tremendous impact on how we conduct business with and for our clients. Each has streamlined processes so that the remodeling experience is much more interactive and enjoyable. We look forward to pursuing new technologies which expand the capabilities of these devices and enhance our customer’s experience.